Christmas is coming! (Either that or it’s just breathing hard.) Did I just type that out loud? Kind of inappropriate for the season, doncha think? But the holiday is fast approaching, and in my turkey glazed stupor, I knew it was time for that most ignominious of holiday traditions (well, maybe not as ignominious as finding a parking space at Wal-Mart): putting up the Christmas lights. Unfortunately, this is closer to my attempt at duplicating that feat. I remember putting up Christmas lights on our first house many years ago . . .
Having put up lights for many years, I had a wealth of bad experiences and mishaps from which to draw knowledge. I vowed that this year would be different. Before even leaving the warmth of my house, I tested each and every string of lights; examining each bulb individually. As I scrutinized each tiny miserable twinkle of light, I thought of the numerous times that an entire string of lights would cease to work just because one globe would go bad. I guess that’s a bad analogy. So armed with my strings of lights, guaranteed to work, a ladder and an illuminated plastic snowman, I head outdoors to trim my house. My daughter accompanies me to “help.” At her age, though, that’s not quite the right word, but being a good father, I let her help, nonetheless. “A long time ago,” she replies, innocently. “I see.” I start to string the lights across the garage roof. At the junction where the garage meets the house, there is a peaked gable that rises too high for my ladder to reach. At this point, I have to climb onto the roof, and mount the lights as I hang precariously on the eave. On the other side of the gable, the roof flattens out again, but because of the shrubbery and landscaping, it is difficult to move the ladder along. And, since I’m already on the roof, it’s easier and makes more sense to just continue stringing the lights from up here. Or so it would seem. Now the key to outside lighting is the wiring diagram. This is not an actual schematic on paper, but an overall plan in my head of how the lights are to be connected. The scheme is complicated by the fact that we have only one outside outlet, located next to the front door under the gable. Therefore, the lights from down below, the lights from the left side of the house, and the strings from the garage roof and gable all have to come together here at this one point near the bottom of the left side of the gable. There, they will all connect into one extension cord that runs to the outlet. Unfortunately, that means the direction of the strings changes, depending on where you are coming from and where you are going. I realize as I bring the strings from the left side of the house, that the plugs (the ends with the prongs, which may be the male ends, I don’t know not having studied the sexual characteristics of electrical equipment in school)–that should be plugging into the extension cord–are at the opposite ends of my house (at the garage and around the left side of my house.) In other words, they couldn’t be farther away from where I need to plug them in. You decide there is no way to plug a non-plug end into the cord, so . . .
And you plunge to the snowy ground below. Lying on my back, on the cold snowy ground, writhing in pain, I make a pretty decent snow angel. But that is not what I was intending to do. The key is to patiently explain this to my daughter. She is very observant. Or she may just be a smart-aleck. I must grant her, though, that technically, I was nowhere near the ladder. I didn’t fall off the ladder—I fell off the roof. I analyzed my problem carefully, and decided that I had absolutely no intention of taking the lights down and restringing them in the proper orientation. As an alternative, I would have to run several extension cords across the front of my house to accommodate the orientation of the lights as they currently were wired. Unfortunately, I didn’t have any extension cords that long—not one, let alone two—so I got the ambulance driver to stop at Wal-Mart and pick me up a couple along the way. Later that afternoon, the moment of truth arrived. With extension cords running every which direction, and wires hanging all over the place, I plug the master extension cord into the outlet, and . . . They don’t light. Well, the left half light, and part of the right half light, but there is a single string that somehow malfunctioned despite my careful pre-hanging test. Of course, all the strings following that string aren’t functioning either. I don’t mean to belabor this engineering point, but if one light bulb goes out in your house, do all the bulbs in every other room go out? No? I didn’t think so. 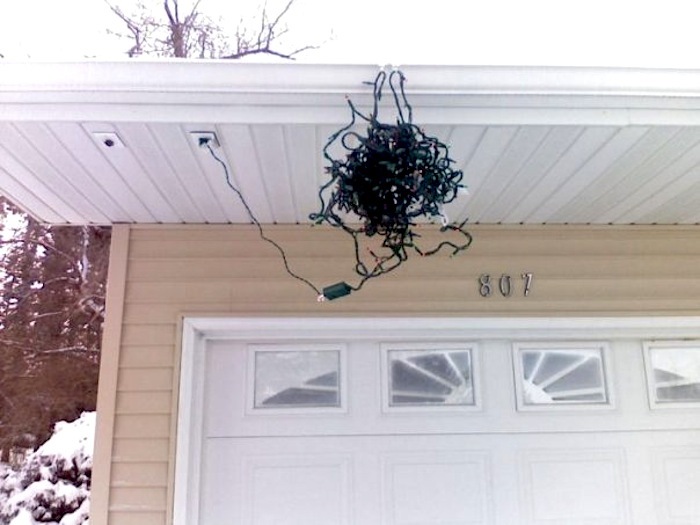 Yet someone thought this would be the perfect way to design Christmas lights. Curse him! Despite my better judgment, I climb back up the ladder and fearlessly crawl onto the icy roof. I remove the damaged string rudely ripping it from the plastic clamps that affix it to my house and return to the safety of the ground below. Inside, in the comfort of my warm house, with my glasses sufficiently fogged so that I can’t really see what I am doing, I plug the stupid string into an outlet. No lights. I shake the string. (This often works.) I jiggle the cord where it enters the outlet. No lights. I shake the string again. (This often works when done a second time.) No lights. I switch outlets. No lights. I methodically take out and replace each bulb with one from a working strand to test the integrity of each bulb. As long as only one globe is out, this should work. Besides, the chances of two globes being out are about the same as falling off my roof twice in the same day. Right? I actually have a light globe tester, but I don’t know how it works and I threw out the instructions. So this is the best method short of just buying a new string of lights, which if I think about this in retrospect, would be the best method after all. After testing each of the one hundred globes, I find I am not able to get the strand to work. As I am considering my options, I realize as I remove the plug from the outlet that it is one of those new-fangled strings with a fuse box built into the plug. I pop out the tiny, charred fuses. After hunting around for twenty or thirty minutes for the replacement fuses that come with the lights, I replace the stupid fuses. Plugging the cord into the outlet, I am dazzled by a hundred twinkle lights taunting me. I grab the string out of the outlet, run outside, climb the ladder, replace the string, and return to my front porch, whereupon I reinsert the master extension cord. I climb back up the ladder, tear open the fuse box in the string of lights, and dump out two more charred little fuses. So its back down the ladder, back into the house, back to finding more replacement fuses . . .
After plugging the master cord back in, I stand and watch the lights go back out in a few seconds. Time to settle this matter for good. Now, you might think that I just replaced the strand of lights, or that I limited the number of strings following it (that likely was causing the overload that was blowing the fuses,) but I am a creature of higher intelligence with opposable thumbs. I cut the end off the string containing the fuse box, and splice the end I cut from something else (the toaster I think) onto it. I wad the whole operation up with electrical tape. In the dark (it gets dark early here in Pennsylvania in the winter, especially when you waste a couple of hours in the ER,) my patch job looks pretty good. Once more, I climb down the ladder and plug the master cord into the outlet. O wondrous sight! They all light—even the stupid looking snowman. My goodness what a beautiful sight. My daughter is applauding from the window and jumping up and down on the sofa. I watch as she inadvertently steps backward and falls off the couch. Like father, like daughter. Boy am I proud. And then, in a twinkling, I hear in the garage, a hissing and sparking from something quite large. I run to the door to see what is the matter. (I accidentally bang my head on the ladder.) And what to my spinning eyes should appear, but a raging fire in the breaker box so near. But I need to rewire some of the lights—if I blow out my neighbor’s power, then I’m really up the creek without a boat. So once more, in the dark, I climb up onto the roof. My hope is to rehang the lights from the left side of the house so they’re not in sequence and can be plugged into the extension cord separately. I just know this will work. As I am re-hanging them, though, I come to the icy patch that caused me such pain earlier today. In order to avoid it, I step over it. Well, it’s kind of a jump or a lunge, since as I go to step over it, I start to lose my footing. I land—on another icy patch. I slip, I fall. If you flap your arms really hard, you not only don’t fly (nor slow down your fall) but you manage to pre-occupy your hands so that they can’t be used to soften your fall.